What Is Jigzone and Why Is It Free? It is hard to find out anything about Jigzone! It is a free site. It seems to be funded by advertising (but there is not a lot). It seems perfectly safe for kids. It offers space for personal galleries. The creators have provided a way for people who like making and competing with Jigsaws to be Buddies. Using the software is not difficult. You do not need to download anything. 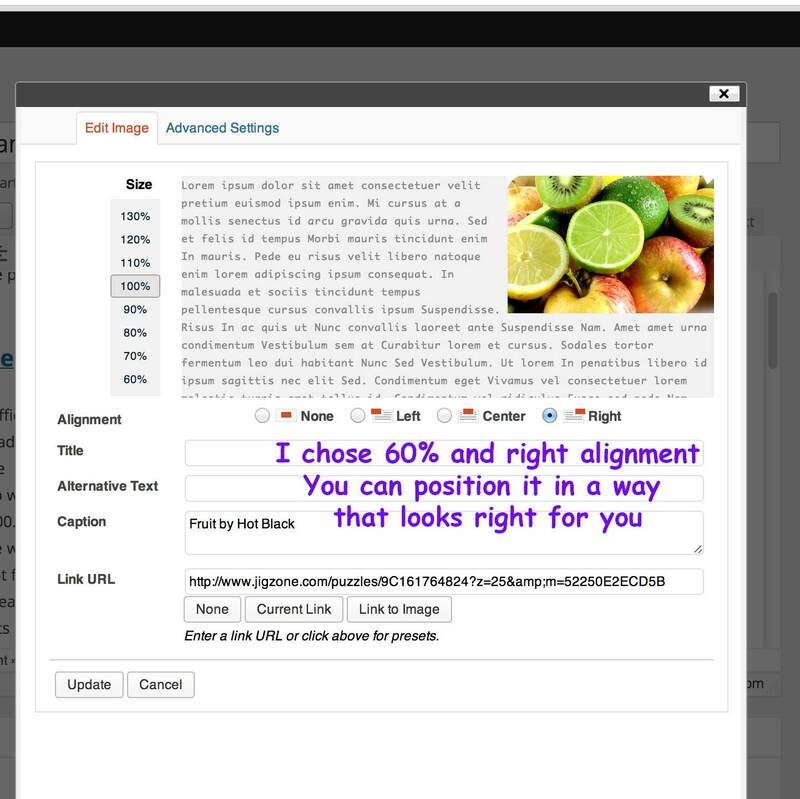 Be sure to cut the images you intend to use to width = 400 pixels and height = 300. If the image is too small there will be grey strips where it does not fit that shape. This can be quite pleasant and often the grey often acts as a contrasting marker. This contrast can be used strategically. I have also just noticed that the html copy paste function on Jigzone is now working! If you would lik to see how this sits check out SLS. 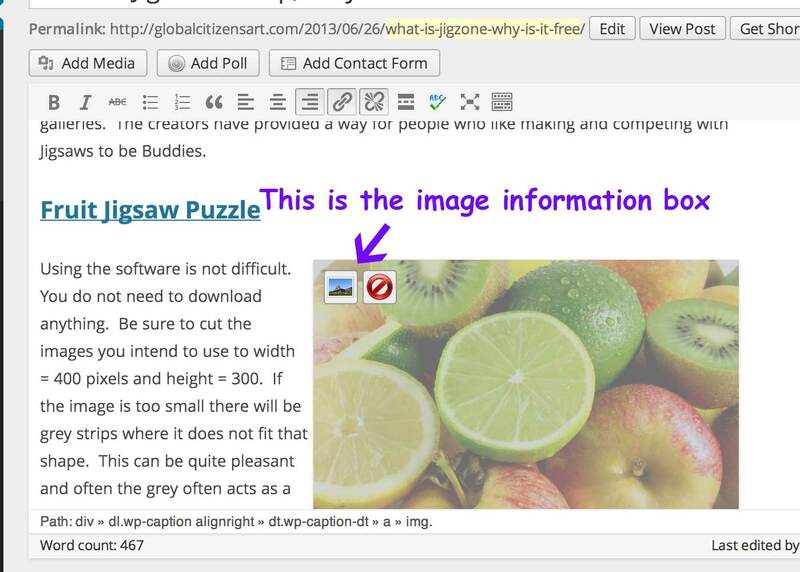 Everyone who uses Jigzone can have a gallery and this means that it is easy for students to file their work. They can name several different folders, which also makes keeping work in categories easy. This makes assessing student work easy for you. Acknowledging the source of images used in Jigzone. Here is the method I have designed for attribution of authorship in the exchange between Morguefile and jigzone. Please let me know if you come up with a better one! Copy and paste the image url into WordPress from Morguefile through the Add Media Button. Right click on the image button and in the Caption space place the name of the image and the author. Also set the size of the image on 60% and click right align. Click edit once the image has uploaded. In the credit section put the name of the photographer and a link to their webspace in the copyright link space. Click on the link that says embed on my website. Click on the image and copy and paste the html into the image link back on WordPress. Now the picture will open at the Jigsaw! Does that sound complicated? Like any other mastery experience it is only tricky the first time you do it. After that it becomes a mechanical process. 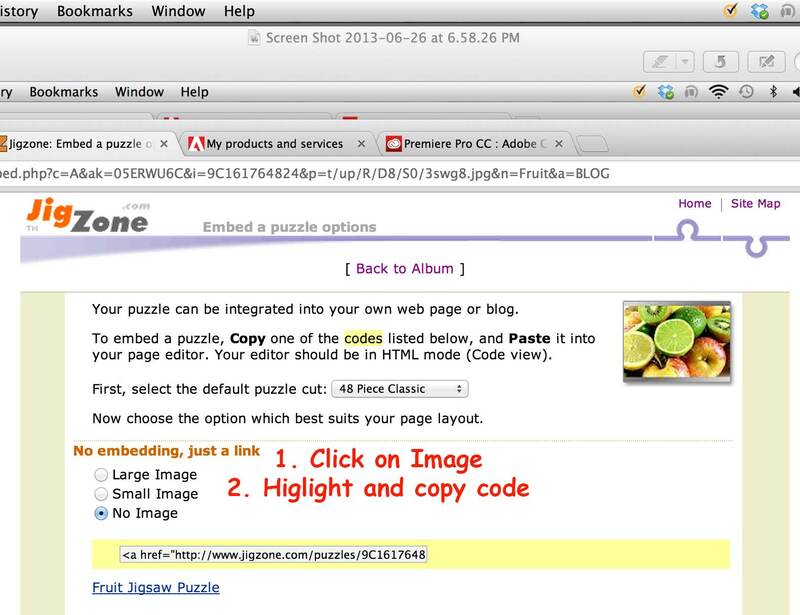 I have also just noticed that the html copy paste function on Jigzone is now working! If you would lik to see how this sits check out SLS. This entry was posted in creative arts leadership, educational leadership, sustainability, work sheets and tagged attribution, buddies on internet, copyright links, creative arts project, free resources, how to cut a kigsaw, jigsaw making, JigZone on 26/06/2013 by Jo Murphy.